oder z.B. 48 Raten à 227,08 € mit der 0% Finanzierung! The Model 15 could be described as "the ultimate in recovery vehicles", allowing the cartridge to retrieve the last nth of recorded material whether digital or analogue, from the vinyl disc and thus approaches the ultimate in perfection. Receiving its inspiration from the superb Model 10 precision turntable the Model 15 seeks to emulate the excellence of our Models 20/3/& 30/2 turntable whilst retaining the more compact footprint preferred by many of our enthusiasts. The Model 15 has been designed with the same attention to detail combined with simplicity of operation that has come to be expected from all SME products. Its superb performance together with laid back styling make it a glamorous addition to your sound system that will astound and amaze listeners for many years to come. The platter is machined from aluminium alloy and weighs over 4.6kg (10 Lb). It is extensionally damped, the top surface being diamond-turned with a fine scroll. This method of finishing upsets a myriad of tiny fibres which interface with the underside of the record. A substantial clamp operating on the reflex principle ensures the largest possible platter contact even appreciable record warp is present. The main spindle is 19mm (3/4") machined from high chrome tool steel, ground super finished and supported in a sealed housing with individually fitted sintered bronze bearings of generous proportions needed to support the platter. 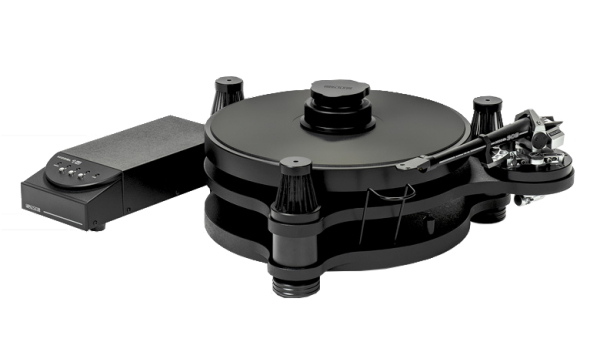 The turntable is driven by a 3-phase, brushless outrunner inductance motor with 8-pole Neodymium magnets and 3 integrated Hall position sensors. The electronic motor controller uses a high performance microprocessor, optimised for motor control. Closed loop speed control is implemented using a proportional plus (PI) algorithm. Fine pitch speed adjustment allows increments/decrements of +/- 0.01% of the selected speed. Speed ranges: 33.3, 45 & 78 RPM. A soft dust cover is provided to accommodate the turntable and arm, when not in use. Standard arm mountings suit all SME 9" and 10" arms. Dimensions: 428 x 378 x 176mm. Net weight: 18.5kg (40 lb). Shipping: 540 x 455 x 390mm. Weiterführende Links zu "SME Plattenspieler 15/A mit SME 309 9Zoll Magnesium Tonarm"
Kundenbewertungen für "SME Plattenspieler 15/A mit SME 309 9Zoll Magnesium Tonarm"